COLOR SCHEME: A planned combination of colors, often based on the relationship of colors on the color wheel. INTERIOR DECORATOR: A profession that involves the art of planning and executing the layout, decoration and furnishing of inside spaces, with the goal of making them more attractive, comfortable and functional. Interior decoration involves selecting colors, furnishings, flooring, lighting and more. INTERIOR DESIGN: A profession that involves more than decorating. Interior designers work on a variety of interiors, including office buildings, airports, hospitals, private homes, shopping malls, restaurants and theaters. In addition to having a sense of style, interior designers need to know about building codes, safety requirements and environmental sustainability. THEME: An idea that unifies an approach to the look of a project. Themes can be inspired by a time period, world culture or area of interest. UNIVERSAL DESIGN: A design approach that ensures that an environment is accessible to people of all ages and abilities. 1. What is a primary color? 2. If you were painting your room in a primary color scheme, which colors would you use? 3. Warm colors appear closer and cool colors appear to be further away. What are warm colors and cool colors? a) Reds, oranges, yellows are warm colors. Blues, greens, purples are cool colors. b) Reds, oranges, yellows are cool colors. Blues, greens, purples are warm colors. Monochromatic: Using shades of one color. An example would be combining light blue and dark blue. Complementary: Using colors opposite each other on the color wheel, such as red and green or blue and orange. 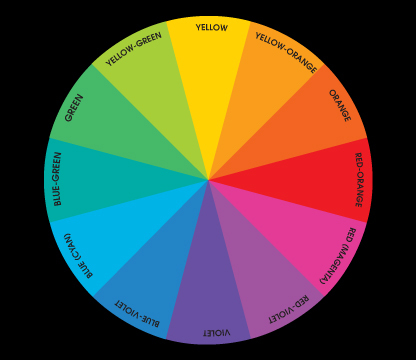 Analogous: Using colors next to each other on the color wheel, such as pinks and purples or yellows and greens.